Prior to Ford's involvement, virtually every large air-transport aircraft was built of wood and fabric. It was Ford who disproved skeptics and popularized the all-metal transport aircraft with the introduction of the Ford tri-motor. And, it was Ford engineers who developed the first radio beacons to guide airplanes to their destinations. 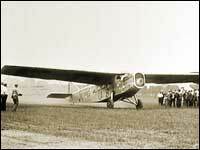 It was a Ford tri-motor that, on February 10, 1927, flew the first long distance flight guided solely by radio signals. In April of 1925, Ford started the first U.S. corporate airline carrying materials and factory mail to plants in Chicago and Cleveland. Henry Ford did all he could to cooperate in the development of the Air Mail system in the United States, a key to the commercialization of aviation. In 1927, Postmaster Kellogg said of Mr. Ford, Too much cannot be said in behalf of the attitude of the Ford Motor company. Quite a long time before this contract service was established, Mr. Ford offered to carry the mails without compensation over these routes so that the department might acquire sufficient data whereon to base its schedules and its rates, and to make the necessary preliminary arrangements. In early 1926, Ford began flying the first regularly operated U.S. Air Mail route. Without a doubt, Henry and Edsel Ford were interested in aviation and its potential to unite the country. At a time when aviation was a new and highly fragmented industry struggling for respect, Henry Ford brought much needed credibility. After all, if Henry Ford were investing in aviation maybe others should take a look at it too! As with the automobile, Henry and Edsel Ford knew there was much to be done. Aircraft needed to be well designed and efficiently manufactured. Just as cars needed good roads, airplanes needed good airports. And in the end, the entire system needed the confidence of the country. Henry and Edsel Ford knew this, as did the Detroit business people who set out to make Detroit to the airplane what it was to the automobile. The idea for an Airplane Reliability Tour is credited to Harvey Campbell of the Detroit Board of Commerce. Campbell called it the "Glidden Tour of the Air," having in mind the automobile tours started in 1904 by a man named Charles Glidden. Just as auto tours had publicized highway travel, so Campbell reasoned, aerial tours would promote air travel. In February 1925, following congressional approval of the Kelly Air Mail Act, a group of Detroit businessmen made plans for an Air Tour. The Kelly Act provided for commercial airline companies to take over the government Air Mail, and now, with the stage set for "commercial aviation," Detroiters talked of building airplanes just as they built automobiles. Civic and business leaders formed a committee, and Edsel Ford donated a trophy  a beautiful structure of gold and silver four feet high, that cost $4,850. Called simply the Edsel B. Ford Trophy, it was inscribed, "This trophy is offered to encourage the up-building of commercial aviation as a medium of transportation." Thus was born the "Edsel B. Ford Reliability Tour for the Development of Commercial Aviation." The official name was altered slightly over the years and ultimately became known simply as the "National Air Tour."